It’s hard to work out what’s going on in Dark Witch Music Episode: Rudymical. The opening cutscene talks about Syega, miraculous stones that let humans use magic and that many have spent their lives researching to in the search for new uses for their power. With magic now used as a tool in everyday lives, it isn’t long before it becomes used as a weapon. The Germa empire is known for having the best researchers studying magic in the world, and, among them, the Ich research team is known as a force to be reckoned with. When they are sent to Liana to secretly continue their research, little do they know that Germa is about to declare war on the neighbouring country. It’s unclear how that really relates to this combat-based rhythm action game, which we’re told is a spin-off to The Legend of Dark Witch. But, in the grand scheme of things I’m not sure that it matters. That’s because once you start playing Dark Witch Music Episode: Rudymical there are more pressing concerns, such as the Boing-Boing that hypnotically bounce in your direction. These spherical shapes must be slashed in time to the music, with the button that you are required to bash determined by their colour. With Green (Y Button), Blue (X Button), and Red (A Button) Boing-Boing to contend with, the experience is made all the more frantic when the enemy that you have come up against throws fireballs and lasers at you. 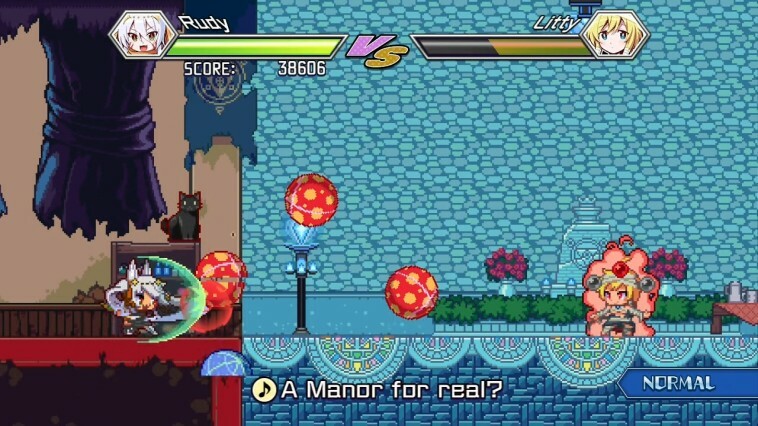 In Story Mode, you play as one of three characters whether that be the god Zizou, the young aristocrat Sola who is searching for her parents, and researcher Rudy who apparently just wants to have a good time. Each will take on eight researchers which, I presume, are from the Ich research team, and the challenge is to defeat them through dealing damage by successfully slashing their Boing-Boing. (Yeah). You are awarded a Perfect, Great, Good or Miss based on how precise your slashes are, and these, along with any successive combo that you have built in that particular stage, are used to calculate an overall score and rank. If you achieve rank A or above you will be rewarded with a Syega stone, that, once enough have been collected, will unlock new characters. With one Syega up for grabs in each stage, that soon throws in an immediate objective to the whole experience. There are multiple difficulties to challenge your rhythmic skill with, in Easy, Normal, Hard, and Lunatic. Even the gentler end of the scale can feel relentless, with the main difference between them being what is thrown in your character’s direction. For instance, Easy will only see red Boing-Boing bounce in your direction, while Lunatic empties the kitchen sink with red, blue, and green Boing-Boing, fireballs, and lasers to keep up with. The scoring in Dark Witch Music Episode: Rudymical is militantly tough, however. Even on Easy, I found that after cutting down every Boing-Boing I would find it hard to ever score above a B rank, and, seeing as that repeatedly denied me Syega stones, I struggled to maintain any enthusiasm for the experience. There’s certainly a balance issue with the scoring that never feels as if it’s tipped in your favour, and that’s worrisome. There are two multiplayer modes that are perfect for the Nintendo Switch, seeing as that they support two players and the separate Joy-Con. Vs Mode will see you compete against one another, whereas you work together to topple a boss in Co-op Mode. 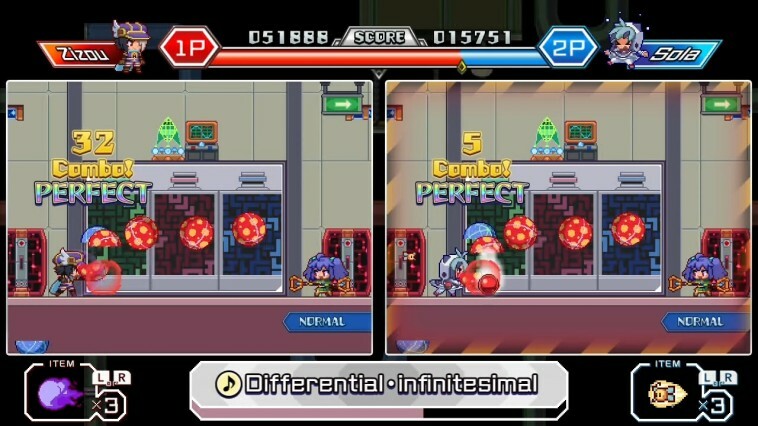 This throws in items to use that can darken your competition’s side of the screen or stun your opponent, but the problem that this faces is that the actual battles are recycled from the Story Mode. For anyone that has already sunk any time into that will either have an unfair advantage or be bored at having to play the same content. It’s a shame seeing as Dark Witch Music Episode: Rudymical has a wondrous pixel art style that, predictably, matches that seen in The Legend of Dark Witch. 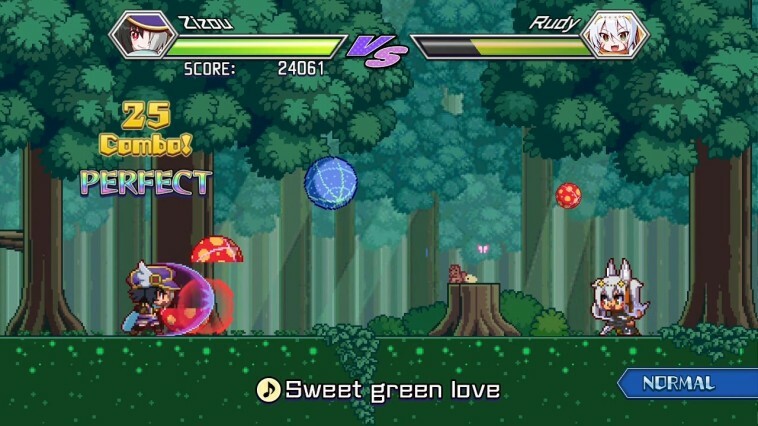 The music, too, while understandably not as sweepingly memorable as that drawn upon for the Theatrhythm Final Fantasy games, is an energetic match for this rhythm action game and comes from Japanese composer Raito. Dark Witch Music Episode: Rudymical can entertain but, after spending some time with it, the lack of breadth and punishing scoring system detract from what is an otherwise promising and at times surprising contender in the genre.